A striking modern building (above) would be constructed on a barren corner of north Minneapolis under detailed plans submitted to the city. The plans offer the first look at a massive partnership between Hennepin County and Thor Construction to overhaul the intersection of Penn and Plymouth Avenues. 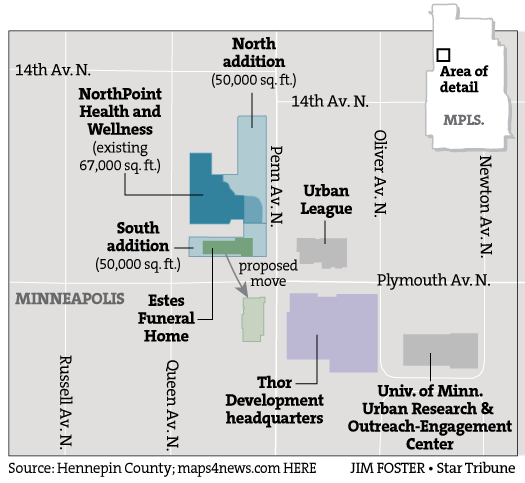 Thor intends to move its headquarters to the site from Fridley. The $35 million building would feature street-level retail (possibly a restaurant), office space, a two-story communty room, a roof plaza, and 620 parking stalls. About 420 of those parking stalls are meant for Northpoint Health and Wellness across the street, which is being expanded as part of the project. The county's investment will reach about $67 million altogether. A committee of the city's planning commission is expected to discuss the proposal next Thursday. Below is a map of the entire project, which would occur in phases between this fall and 2019.